The main reason to have a garden koi pond is the fish—collecting them, caring for them, and watching them swim beneath reflections of sky and foliage on the pond surface. Koi aren’t just garden decoration. For some, they are collector’s specimens; for others they are pets. For many people, keeping koi ponds is a source of stress relief. There has long been anecdotal evidence that watching aquarium fish relieves stress—which would explain why some doctor or dentist offices keep fish tanks in the waiting rooms. Science across variety of disciplines has begun to back up that notion with fact. Without some sort of refuge, everyday life can build up a backlog of fatigue, stress and overstimulation. Watching the liquid movement of koi rippling the surface of a beautifully designed garden pond, it’s easy to settle into a blissful meditative trance. Koi respond to people. They will rise to the surface in response to sound of footsteps on the patio as you approach. A certain species, the Chagoi, is known for being especially friendly, and will usually be the first fish to become tame enough to eat out of your hand. The Chagoi is not a colorful fish. It comes in shades of basic brown. But it’s got a great personality, as they say. Add one to the pond and it tends to change the dynamics of the entire group. The Chagoi comes up to greet you because he’s friendly (or the most aggressive feeder). The others soon lose their fear and follow. In this way, the Chagoi serves as the “team leader” for the pond. Once one fish starts eating from your hand, the rest soon follow. 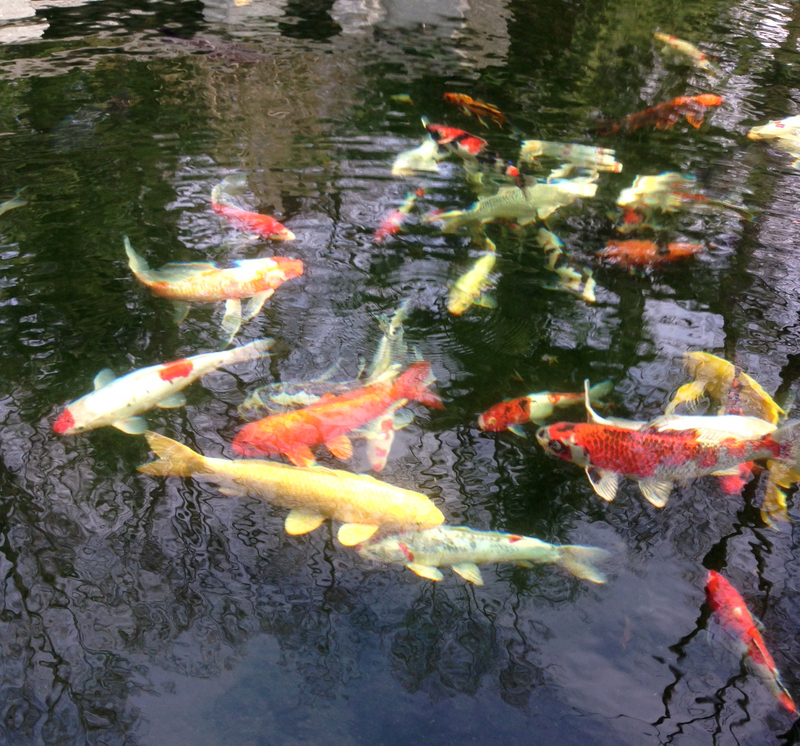 Many Surrounds clients go to Blue Ribbon Koi (Catharpin Virginia) to select fish for their koi ponds. Owner John Bianchi says, “people who are into koi collecting can be WAY into it.” They care very much about the species and breeding lines of the koi—not unlike people who invest time and money in show dogs. They keep and care for a collection of pedigreed koi in their ponds. Imported koi come from Japan, Israel and China. The most sought after are thoroughbreds from Sakai, one of the top Japanese breeders. They are meticulous about how the fish are raised and highly selective about those they release for sale. Again, there is that similarity to dog breeding in that the breeder is trying to achieve an ideal body shape and distinctive markings. The patterns on the fish should be distinct with clear breaks between colors. Speckling or fading is considered inferior. It is not necessary for you to stock your pond with pedigreed koi. Bianchi confirms that beauty is in the eye of the beholder: “I’ve got customers who say they want only pedigreed Japanese bred fish. That same person will come into the shop, see a domestically raised fish and fall in love with it because it’s beautiful.” The most important thing is to purchase from a reputable seller. Otherwise, paying more won’t guarantee you are getting a better fish. As long as you know what you are getting for your money, get what appeals to you. Your definition of beauty doesn’t have to be imported or from an ancient lineage. A koi pond has specific design requirements. The smallest pond (with proper filtration) should be no less than three feet deep and approximately 8×8 around. It must hold at least one thousand gallons of water. That size will support no more than six small fish. 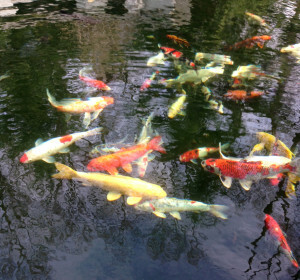 An average koi pond would be three thousand gallons and anywhere from four to seven feet deep. The deeper the better because the larger water volume can support larger fish. Also, water pressure from the depth helps the fish grow bigger. Another reason for having a deep pond is weather. The fish go dormant in the winter. They lay on the bottom all winter once the water temperature drops below fifty degrees. Like an indoor aquarium, a koi pond it requires filtration equipment to keep the water clean and aerated. And regular maintenance is required to keep the water quality pristine. Koi are a hardy species and, if well cared for, can live 60 years. Some people enjoy the simple daily and weekly tasks needed to keep the fish healthy and happy. There are other equipment maintenance tasks best left to a knowledgeable professional. Koi care and pond maintenance fall under the Surrounds garden management programs. We perform regular services to keep water filters clear of sediment so they can keep algae growth in check. We check equipment to ensure it is mechanically sound and that the water is clear. You don’t have to worry about it. All you have to do is decide when you are going to sit down and enjoy the beauty of it. Please feel free to contact us if you’d like to learn more about how to keep your koi pond ecosystem in peak condition.